Albert was adopted in Jan 2010. Albert was found in a corporate parking lot; a young kitten all alone. A charitable soul brought him to the Cat Clinic for a checkup and as a stopping place on his way to a forever home. 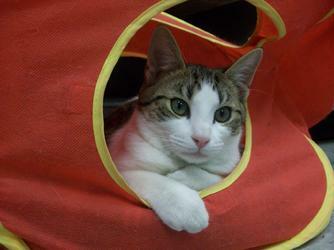 Albert quickly charmed everyone at the Clinic and got on tremendously well with all the cats at the Clinic. Now he has 2 other cats to play with in his new home and we're sure he's enjoying the good life with his adopted family. Ben was adopted in Dec 2009. Ben was dropped on our doorstep in Oct 2009. This high-energy boy provided loads of comic entertainment at the Clinic and we eventually learned that we could not leave any food unattended when Ben was on the prowl. Ben was adopted into a home with a pair of energetic youngsters who can more than keep up with Ben's frantic pace. Maggie was adopted on Thanksgiving weekend 2009. Maggie was trapped at a warehouse as part of our TNR program in September 2009. Most trapped cats are released in their original home after spay/neuter surgery but Maggie had such a sweet, friendly temperment that we felt she could easily find a good home that would be safer than the warehouse. Her new family provided exactly that, giving Maggie a nice indoor home and also giving all Maggie's fans at the Clinic an extra reason to be thankful. Poppy was adopted in November 2009. 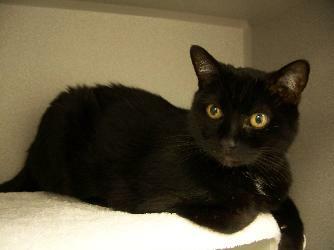 This girl just loved being touched and is a most easygoing feline. She was quite thin when she arrived but rapidly gained back the weight she needed. She found a lovely couple who brought her into their home & is enjoying the good life these days. We miss her sunny personality and look forward to seeing her for her regular vet visits. Moses was adopted in November 2009. Moses is a big, handsome guy, quick to roll on his back and show you his belly. He was not crazy about other cats, so he was very excited to go home with a family where he could be the only star of the show. His big, rumbling purr is missed by all at the Clinic. Rusty Firepaw was adopted in October 2009. FirePaw's lived at the Clinic for more than a year before he was adopted. His spunky enthusiasm and birdlike chirping is missed by the Clinic staff, but we're all thrilled that he has finally found his forever home. Sheba was adopted in September 2009. Sheba was born at the Clinic in May 2008. She was adopted and lived for a year in a good home with both dogs and cats ... until a boyfriend moved in along with his allergies. Sheba came back to the Clinic for a short visit while she was looking for her new, forever home. She found a great home very quickly and is now getting to know her new adopted family. Garbo was adopted in July 2009. After her amazing job of mothering her kittens was done, Garbo was not thrilled with her life at the Clinic. She didn't care much for other cats & cried woefully when locked in a kennel. She is quite fond of most people though & adopted a couple who had recently lost a long time feline companion. She's now living a luxurious life as the feline queen of her new home. Apollo was adopted in March 2009. 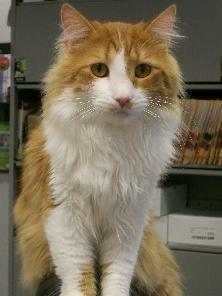 This laid-back gent finds great joy in a warm lap and a petting hand. He now enjoys sharing his forever home with his new canine roommate Edie. This sweet pair of cats had been on display together in the Clinic lobby, in the hope that they might be adopted as a pair ... & they were adopted together into a new home! Momma arrived at the Clinic pregnant, and soon thereafter had 5 beautiful kittens. However Momma arrived with an upper respiratory infection, and lost one of her babies as a result. The other 4 kittens thrived and all kittens except Mini Me, were quickly adopted. We're glad the this mother-daughter pair of calico beauties found a forwever home where they can continue to enjoy each other's company. Eliza was adopted in Oct 2008! Eliza was adopted on Halloween! What a treat! Eliza kitten came to us from a Chattanooga parking lot at 8 weeks old. With regular feeding and care, she became a healthy, playful and very affectionate kitten. Although she enjoyed life at the Clinic, she now entertains and enlivens her new home. Sister Golder Flower loves freedom and hated being in a kennel at the Clinic. Sister loves humans and was not fond of other cats, however in her new home she has found a new best friend in Dusty, her spunky Bengal roommate.